Tottenham crash out in the fourth round of the FA Cup after losing 2-0 at Crystal Palace on Sunday, and defending champion Chelsea beat Sheffield Wednesday 3-0. Crystal Palace took a ninth-minute lead when Jeff Schlupp’s shot was saved by Paulo Gazzaniga but the Spurs goalkeeper could only push the ball into the path of Connor Wickham and he scored off his thigh. The hosts extended their advantage after Kyle Walker-Peters handled in the penalty area with Wickham lurking. Former Tottenham winger Andros Townsend slammed the resulting spot kick straight down the middle in the 34th. Tottenham got a penalty of its own 10 minutes later when Patrick Van Aanholt brought down Juan Foyth, but Kieran Trippier fired well wide to ensure the Eagles took a 2-0 lead into the break, and then survived a second half dominated by Tottenham. Tottenham manager Mauricio Pochettino tried to look on the bright side after the defeat to Palace. “Of course, disappointed because, after Thursday and today again, out of two competitions. You feel disappointed. You can’t feel anything different,” Pochettino said. Tottenham, which is third in the Premier League, plays host to Borussia Dortmund in the first leg of the Champions League round of 16 on Feb. 13. The force of VAR was with Chelsea on Sunday against struggling second-tier Sheffield Wednesday. Chelsea conceded a first-half penalty, which the video assistant referee subsequently overturned, and quickly got a penalty of its own, which VAR confirmed. 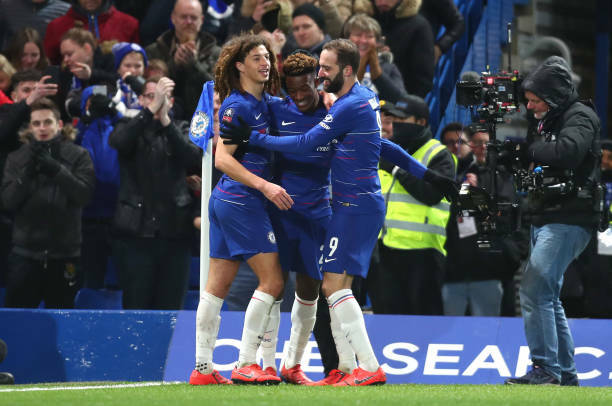 Callum Hudson-Odoi scored on what could be his final Chelsea appearance and Willian netted twice at Stamford Bridge. Hudson-Odoi started despite reportedly submitting a transfer request in an effort to force through a move to Bayern Munich ahead of Thursday’s transfer deadline and the 18-year-old winger netted Chelsea’s second after 64 minutes. Sheffield Wednesday had a penalty overturned by VAR after 22 minutes and Chelsea had a spot-kick awarded four minutes later, Willian converting from the spot, after referee Andre Marriner’s decision had been confirmed by VAR. Willian added a late third as the Blues advanced to the fifth round. Gonzalo Higuain made his first appearance as Chelsea made eight changes following its win over Tottenham. Higuain made his debut after signing late on Wednesday on loan from Juventus.